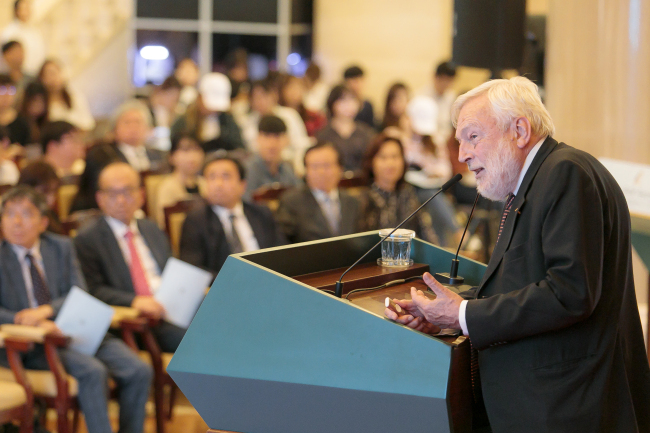 A panel of experts including leading sea ice scientist Peter Wadhams gathered in Seoul on Tuesday to discuss the growing threat of climate change on the opening day of Peace BAR Festival 2018 at Kyung Hee University. The 37th Peace BAR Festival began in the run-up to the United Nations’ International Day of Peace on Friday, with peace and climate change set to take center stage during the event. Kicking off the three-day academic event, professor Wadhams, who is visiting Korea for the first time, took the podium and gave a thoroughly researched presentation showcasing documents from his time as a researcher in the Arctic and highlighting the growing threats posed by rising global temperatures. During the presentation, Wadhams, who penned the book “A Farewell to Ice: Climate Change and Global Peace,” showed pictures and graphs documenting dramatic changes in ice levels around the Arctic Ocean between 2005 and 2012. In a photo he took of the Northwest Passage from a Canadian ship, Wadhams said ice was broken up but still thick and the crew had to push it. In 2014, however, ice in the same area during the same time of the year became “pathetically thin,” and according to Wadham’s account people could no longer even safely walk on it. Wadhams also said people tend to think a fairy small amount of increase in the sea level is not bad, but it could mean higher chances of disastrous events in places like Bangladesh. 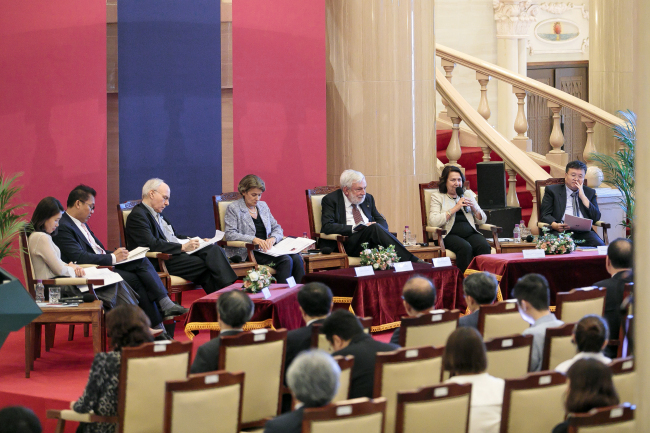 A panel discussion moderated by Irina Bokova, former director-general of UNESCO and endowed chair professor at Kyung Hee University, continued to focus on the issue of climate change. Panelist Maria Pia Casarini, director of the Zavatti Polar Institute, emphasized the importance of recognizing climate change, saying it is the people who will have to bear the brunt of climate change. Fellow panelist Kim So-hee from Climate Change Center said her organization is planning to file a petition to Cheong Wa Dae through its official website, to make sure the National Pension Service is not used to fund the fossil fuels industry. Speaking to The Korea Herald, Wadhams gave suggestions on how people could help tackle climate change. This year’s Peace BAR Festival runs through Thursday, with the focus of panel discussions shifting from Tuesday’s climate change to peace on the Korean Peninsula and across the rest of the world on Wednesday and Thursday.